Ok, confession. I don't share many sewing tutorials on here. So, sit back and enjoy this rare moment. I like to sew but I'm no pro at it. I'm self taught and don't really know all the fancy-schmancy terms. I get asked at work all the time "Do you sew?" and I always reply, "Kind of". I consider myself a craft sewer (ever notice how sewer, as in one who sews, is spelled exactly the same as sewer, as in the yucky place under ground? Ya, I just noticed that myself). I guess the correct term is seamstress but lets face it, I'm a crafter, not a seamstress. So, if you are a pro at sewing you have my permission to move on. Just look the other way. However, if you are not, and you like to dabble in textiles and crafting, than by all means, please enjoy this simple little project. 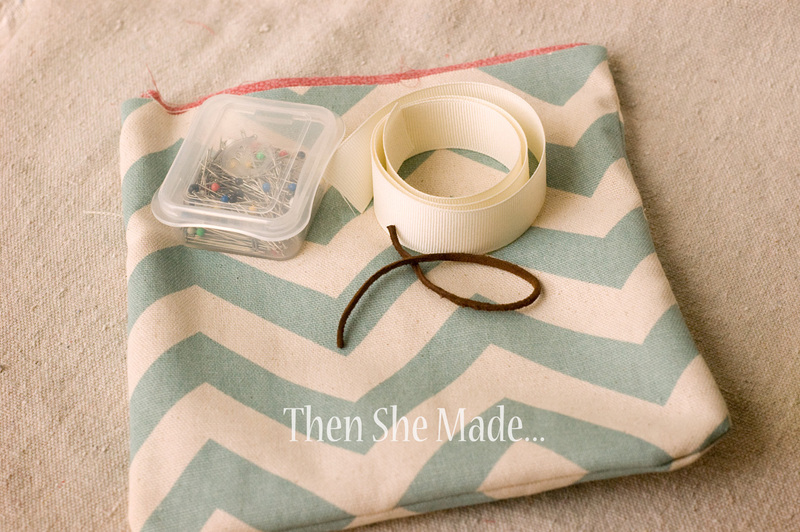 You'll also need all the basics for sewing like thread, pins, scissors, and a sewing machine. Step 1: We start by making the most basic, simplest pattern ever. Take your piece of paper and fold in half long-wise. Then eye-balling it, cut off a little bit off the top, probably about 2 inches. I really don't know, I didn't measure. Throw the little piece away but keep the larger piece. Step 2: Open your paper up and there you have it - a pattern. Whoa! I know, that was pretty complicated. Next, take your pattern and trace out, then cut two squares from each type of fabric. When you are done you should have four squares total. 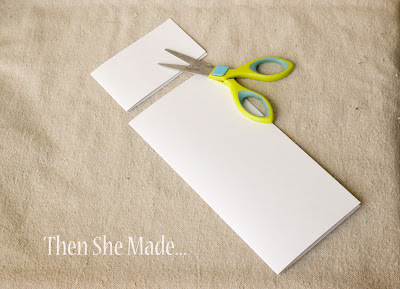 Step 3: Take your squares and place them with their matching color and put right sides together. You could, and probably should, pin them together on three sides. I didn't. See, a pro would probably pin. Step 4: Starting with one set, sew along three sides of the square. Then repeat with the other set of squares. 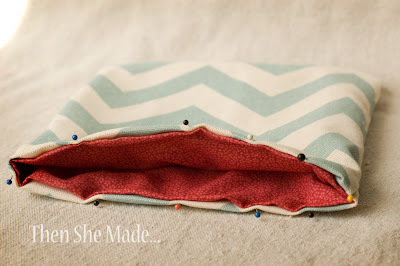 Just make sure you are sewing each set with the same seam allowance and that you only sew three sides, not all four. You need to leave one side open for it to be a bag. Step 5: After the sides are sewn, I always take the bottom corners and just sew a little diagonal line and then trim off the excess fabric. This just helps the corners to fit into each other better. Step 6: Next, take one - only one - of your sewn squares and turn it right side out. 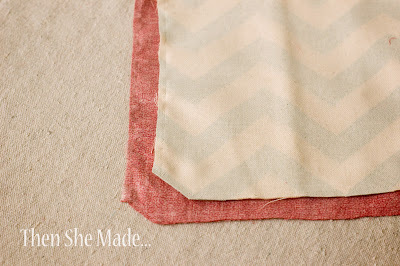 I turned the chevron pattern right side out and left the red fabric with the right sides together. Then place your two sets together, one inside the other. To do this just put the set that is still right-side together (red) into the other one that you turned right-sides out (chevron). We've reached the point where you will need your other supplies. So grab your ribbon, leather and pins. Step 7: Fold down each raw edge and pin the inside and outside together all along the opening. Ok, here we go again, a pro would probably measure it all and iron it in place - I did not do that but you sure can. You will get a crisper, more polished look if you do. Step 8: When you've got the two fabrics pinned how you want them, simply take your ribbon and tuck one end in between the two layers of fabric and pin in place. 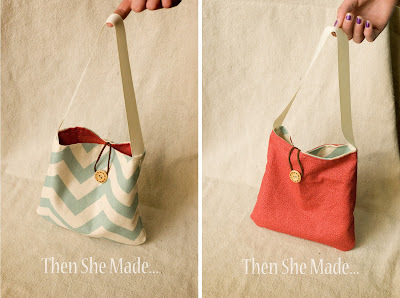 I prefer my bag handles to line up with the side seams like shown in the photo above. Once you get one side in place, repeat with the other end. Step 9: And finally, before sewing it all together, take your leather piece - or thin ribbon - and tuck the ends in between the two layers of fabric, just like you did with the ribbon handles only this time you are putting both ends of the leather on only one side of your bag. The ribbon ends went on opposite ends of the bag but the leather stays close together in the middle of the bag. 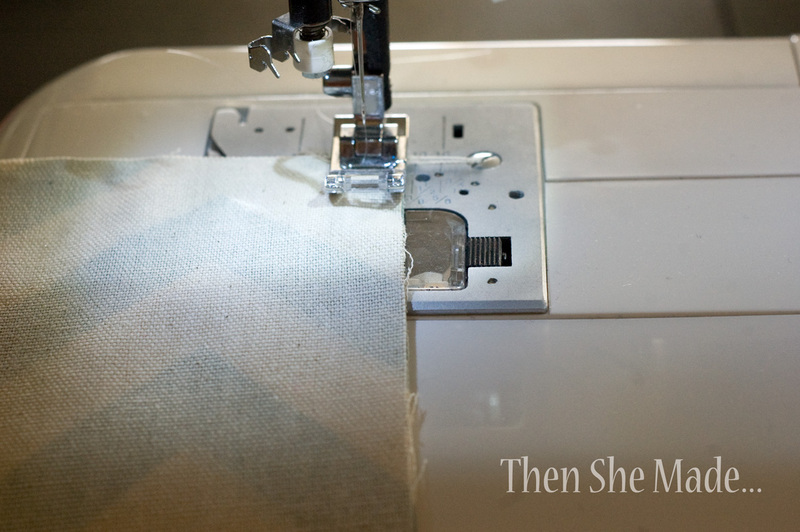 Step 10: (Not shown) Using your machine just do a simple straight stitch all around the opening of the bag. This will sew the two fabrics together but also secure your ribbon and leather in place too. Step 11: Once it is all sewn together, it's time to add the buttons so that the bag can close. To do this take your leather loop and pull it across the bag and down to the front side. Carefully mark where it falls - this is where your first button will go. Also, keep in mind, you don't want it pulled too tightly or it might not close later on when the bag has stuff in it so make sure you leave a little wiggle room. Step 12: Start sewing on your first button. 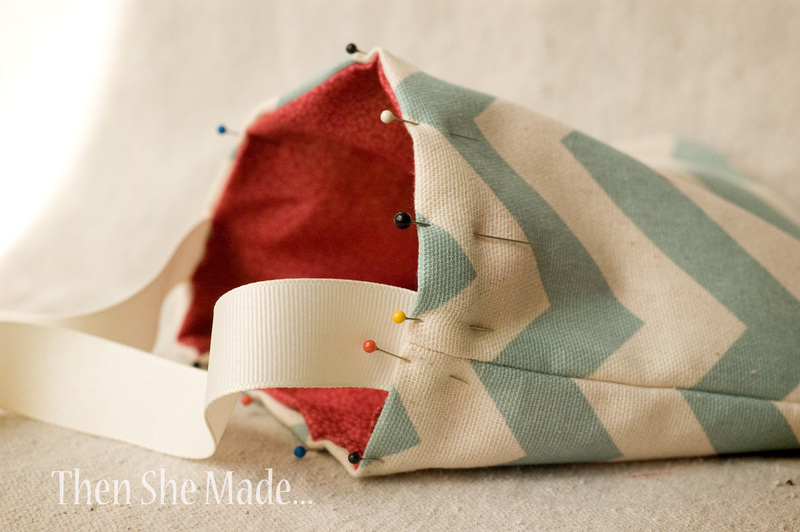 As you push the needle through the fabric on the outside of the bag and into the fabric on the inside, attach the other button. 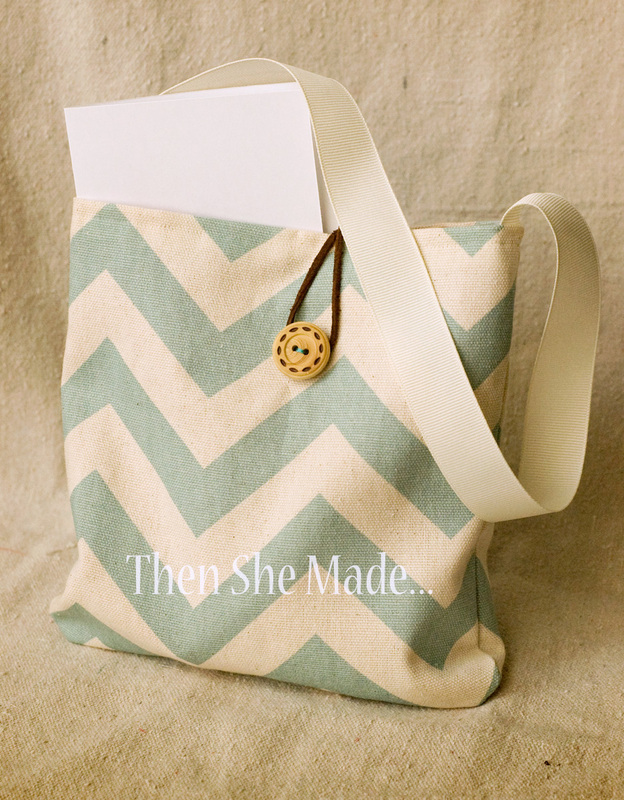 Remember this bag is reversible so you need a button on each side. Also, don't pull your thread so tight that your buttons end up laying flat against the fabric. You need the buttons a little loose, but not too loose, or leather won't be able to wrap around it. And that's it. Here is the bag all completed with the loop around the button. And, if you turn it inside out to make it reversible you'll see that the loop and button on the red works just the same as on the chevron. 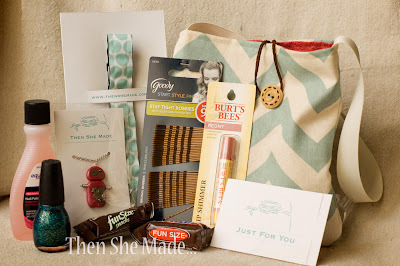 These little bags are really cute and do add a personal touch to gift giving. True, a .99 cent paper bag is easier but these are unique. Plus you can make them in any size you need, can wash them, and can re-use them over and over. Well, once you give it away it's probably not a good idea to ask for it back. However, the recipient could use it to pass along or they could use it as a little purse. My girls used these as purses for a long time when they were little. 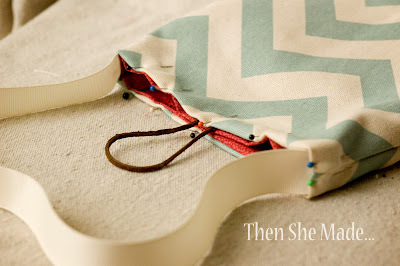 You can make the strap long so it goes cross-body, or you can make it short so it's just a little grab handle or, like the one I just showed, you can make it long enough to be a shoulder bag. My girls liked the cross-body version best for purses. So, back to giving it as a gift, I like to fill ours with girlie things like headbands, necklaces, nail polish, lip gloss, etc... The bag, even though it is small, will hold a lot more than you think it will. And here is it is all filled up and ready to go. I think I've seen the term sewist a lot lately... but I had never thought about the sewer/sewer spelling! Too funny! I really like your bag. :) Have a happy day! What a super bag, I just love it. Thanks for the tutorial. Thank you so much for sharing. This will be a great summer project for my daughter who loves to sew! 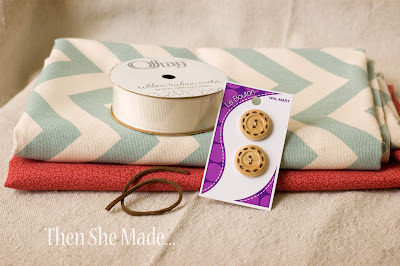 Just a little tip for sewing on buttons. Place a pin under the button so it holds the button a bit off the fabric. Sew n the button and before you tie off, remove the pin and wrap the thread around the underside of the button several times. It creates a thread shank. Hope you find this useful!